Over the past few years, OnePlus has emerged as a remarkable smartphone manufacturer around the Globe. With its concrete hardware and overwhelming software support, OnePlus topped everyone’s list in the Android Community. Lately, the flagship OnePlus 3T has also been rated as one of the best smartphones in India. Moreover, the OnePlus 3 and 3T are the first non-Google devices to receive the Official Android 7.1.1 Nougat update based on Oxygen OS 4.1.1. Even though with such astounding software support, the 2015 flagship- OnePlus 2 is still running the OxygenOS 3.5.8 based 6.0.1 Marshmallow. 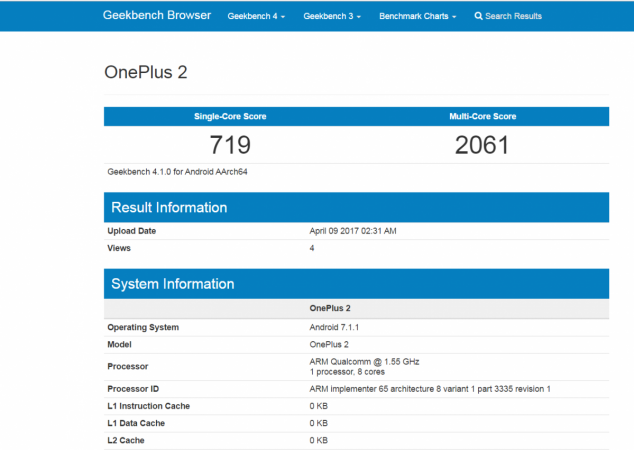 Previously, OnePlus 2 loaded with Nougat was spotted on Geekbench in March, it showcased that the device will soon be updated to Nougat. However, that has not happened yet. The OnePlus 2 users are impatient and really annoyed due to the over-delayed update. To highlight the issue, a Thunderclap campaign has also been created on OnePlus Forums with almost 3 lakh social reach and 1000 supporters. As of now, there is no Official reply from OnePlus on this issue. While everyone was waiting for OnePlus’s reply on the delay, the OnePlus 2 with Nougat again surfed on Geekbench yesterday. This becomes legit to comment that the OnePlus team is still working on the Nougat for OnePlus 2 and will release the Official update once they are done with the testing. Moreover, the tests on Geekbench shows improved results in terms of the single-core test, where it scored 712 points, 112 more than last month’s 600. Nashville Chatter reported, the multi-core tests was a bit opposite, where it could manage to get only 2061 compared to the previous one. This eventually means, the Nougat will be rolled out to the OnePlus 2 once it is out of testing. It will probably take a couple of more weeks of testing. So, we predict that the Official rollout should happen around May, which is next month. Unfortunately, this is the end for OnePlus X and it will not be updated to the Nougat firmware. The device’s SoC Snapdragon 801 does not support the Vulcan API which is needed for Android Nougat. Meaning the OnePlus X users will only be getting the Android 6.0.1 Marshmallow based monthly security patch levels from the AOSP. Meanwhile, if you get impatient waiting for the OnePlus 2 Nougat update, you can try the HydrogenOS based on Android v 7.1.1 or the custom ROM like LineageOS based on Android 7.1.2. The H2OS is an alternative ROM for the OnePlus devices and comes as stock firmware for the Chinese variants on OnePlus 3/3T, 2, and X, whereas the Lineage OS is one of the most popular custom ROMs for Android phones So, it is completely safe to install the same. Head over to the links given below to install the same.